Sunday during nursery at church, Lily took a tumble into the metal door hinge and took a nice little gash out of her forehead about 1/4" wide. It wasn't too huge, but it was the depth that was a little scary. I heard her crying just when communion was starting. Figures, it was my kid wailing during the most serious part of service. I figured either she was protesting getting her diaper changed or she heard the music and got upset when I didn't show up. I was just about to get up and sneak out to see her, when one of the nursery workers (the pastor's wife) stuck her head in to get me. Jacob was in her arms. That day started the LED notification system they were supposed to use to summon me. But I guess when there's blood involved, no one wants to push buttons when they can walk the 10 feet to just come get me. She told me, "Lily fell, I'm going to get ice." She carted Jake towards the kitchen with her. I just figured it was one of Lily's normal falls. 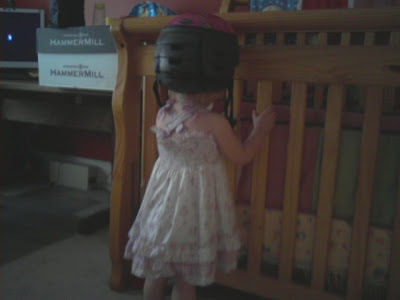 The poor little clumsy girl falls and hits her head a lot. 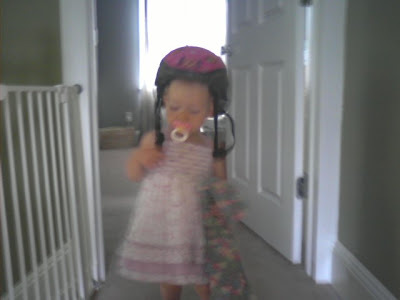 Ryan and I have joked that maybe we should keep a helmet on her. Maybe now it's not such a joke. I get in there and see blood. I wasn't expecting that. The only times Lily's hurt herself enough to bleed, it's been her mouth. For instance: she's fallen and hit her mouth on the steps while crawling up them multiple times. So I hold my little baby in my arms and take her to the rocking chair. I sit down and she holds me tight, her head against my shoulder as she screams. This is not typical. Usually, Lily arches away from you while she screams, and wants to be put down even while still crying. I was handed the ice, but held tight to my little girl, relishing the moment and knowing that comforting her was my top priority. The service ended shorty after, and everyone who saw her forehead wanted to know what happened and suggest what I should do. I probably wouldn't have thought about the stitches factor if so many people hadn't said the same thing. Our friend Brian was an EMT so he cleaned the wound and also suggested taking her to get it checked out. I called our pediatrician, and she said to have the ER look at it. After Ryan and I got home, we put our crabby daughter to bed. The long 4th of July weekend had screwed up her nap schedule and she desperately needed sleep. 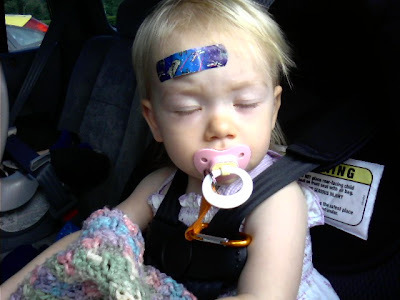 We hoped the band-aid we put on her forehead when she got home would not be removed, unlike the band-aid she took off in the car and played with the whole ride home. It was funny, sitting around for hours while she took a good, long nap, knowing we were going to be taking her to the ER once she woke up. You usually don't picture the ER as somewhere you PLAN on going. Eventually she woke up and I took her in. Ryan waited in the car with Jake b/c we didn't want him exposed to a million hospital germs at just 7 weeks (ER germs seem much different than postpartum germs). Three different nurses look at her and repeatedly question why it took us 6 hours to bring her in...it was almost accusatory, like our postponement signaled neglect. That frustrated me a little. It's not like this was the kind of injury where waiting changed anything. The doctor came in with a little clear plastic tube in his hand...it reminded me of a disposable saline solution vial. He told me it was liquid stitches and we were basically going to glue Lily's wound shut in place of traditional stitches. 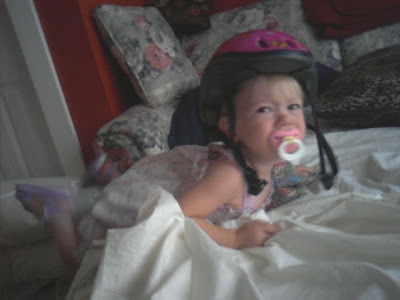 We held her down on the bed and he told me she would cry because of the restraint, not from the glue. But once it was over, she was back to her normal happy self and I'm sure she had no idea what all the fuss was about all day. She probably just thought she banged her head like always and, "Why does everyone keep poking at it?!" We're glad it's over with and that she hadn't hurt herself much worse than she did. That could have been her eye and not her forehead. The doctor said the "stitches" will last for five days, so don't disturb the area with soap or lotions during that time, and cover it with a band-aid only if she messes with it, which she hasn't. The whole area is hard, like crazy glue. oh poor lily. How is she doing? thats pretty scary but it didn't seem too bad - at least the band aid covered it. I think we'd do the same - wait a while before we took him to the doctors. its good she didn't have stitches.